Preseason Questions: When Will Wichita State’s Regular Season Streak End? 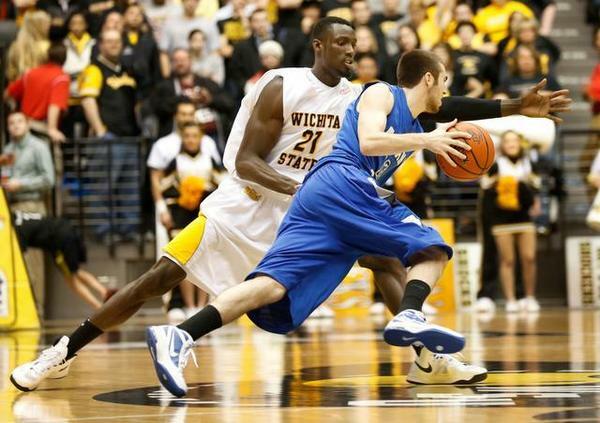 On March 2, 2013, Wichita State and Creighton played a game initially notable for the fact that it would be the Jays’ final regular season game in the Missouri Valley Conference. Somewhere in the midst of Creighton rolling to a 12-point victory in Omaha, the contest became less about the Valley swan song and more about Doug McDermott, who poured in 41 points on 15-of-18 field goal shooting. At the time, it appeared to be a day to quickly forget for Gregg Marshall’s Shockers, and forget they did: Wichita State was playing in the Final Four just five weeks later. Fast-forward from that point more than 20 months, though, and that regular season finale has developed a new reason for recall – it’s the last regular season game Wichita State has lost. The Shockers will be sporting a 31-game regular season winning streak when they take to the Roundhouse floor tonight, where New Mexico State will be the latest opponent to have a crack at snapping the streak. Gregg Marshall’s team will face challenges this season that never afflicted last year’s team, but it returns a nucleus capable of maintaining an established lofty standard. So we ask: How good can these Shockers be, and exactly when will the regular season streak end? 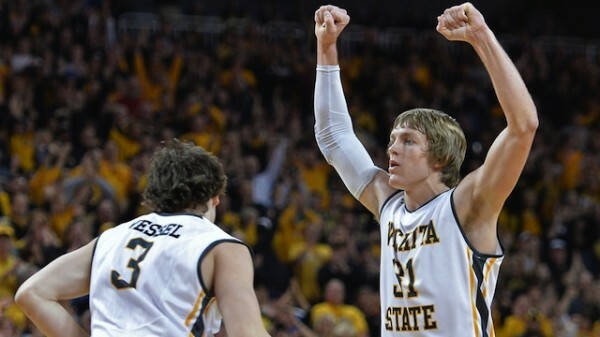 How Long Can Ron Baker And The Shockers Keep Winning? 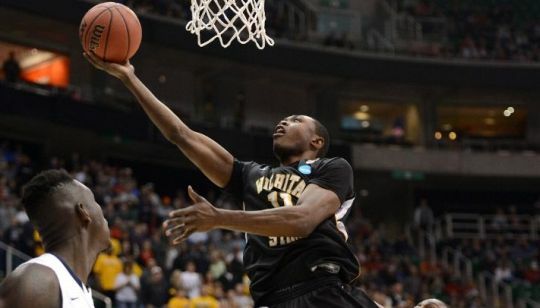 Wichita State will miss Cleanthony Early. List as many reasons as you want for the magical run of a season ago – Gregg Marshall’s coaching; utterly committed team defense; grinding offensive execution – but the Shockers also had the luxury of Early, a player with the athletic tools to dominate any game if needed. 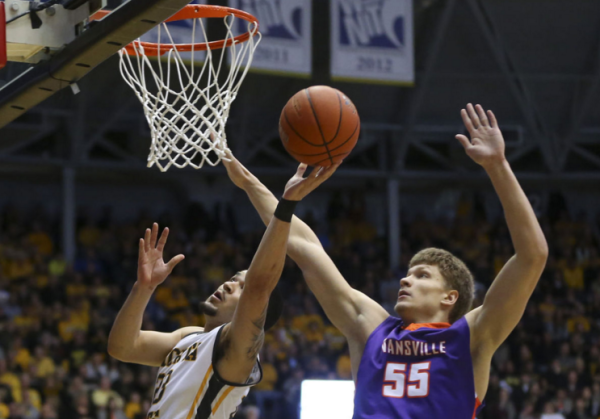 In 2013, Early’s 39-point explosion against Southern Illinois saved the Shockers from a near-upset at home. Last year at Indiana State, he scored 15 of his game-high 19 points in the second half to stave off the Shockers’ primary Valley challenger. And in that lone, season-ending loss of 2014, it was Early who matched Kentucky’s NBA talent shot-for-shot down the stretch, keeping the Shockers afloat. The current New York Knicks forward may not have been the most consistent Shocker during his two years in Wichita, but his athleticism and scoring ability made him a dynamic dimension that few college basketball teams – power conference or not – could lay claim to. Ron Baker, Fred VanVleet and Tekele Cotton will deservedly reel in plenty of acclaim this season, but for the myriad talents of that trio, none possess the game-breaking abilities of Early. This team will need to find its way without a take-over scorer. Day four of Championship Fortnight means three more conferences tipping off today, so what better way to get you through the next two weeks of games than to break down each of the Other 26′s conference tournaments. Today, the MAAC, MVC and WCC get started. What to expect: The big story here will be Wichita State’s undefeated season. Can the Shockers become the first team since 1991 UNLV to enter the NCAA Tournament with an unblemished record? Or will Indiana State or Northern Iowa pull an upset and force Wichita State to settle for equaling 10-year-old history? Recall Saint Joseph’s went unbeaten during the 2004 regular season before falling in the quarterfinals of the Atlantic 10 Tournament. 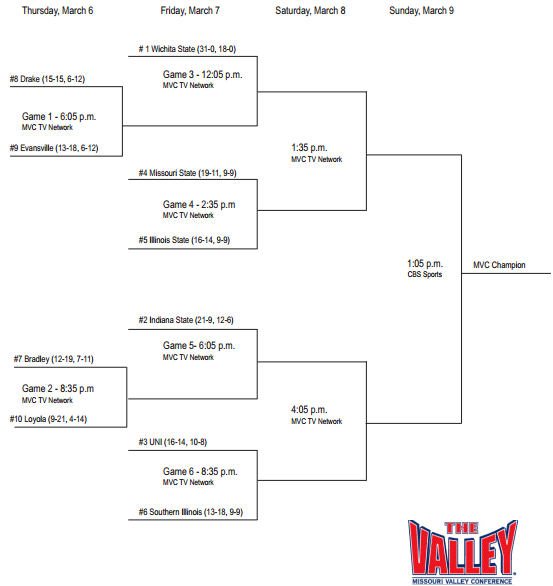 The MVC is down compared to years past, undoubtedly exacerbated by Creighton’s departure to the Big East, and it will be a shocker if Wichita State and Indiana State don’t meet in Sunday’s tournament final. Favorite: Wichita State. As if this needed answering. The Shockers have romped through the Missouri Valley this season, winning their 18 games by an average 15.6 points per game. Wichita State is a top-15 team on offense and defense, according to Ken Pomeroy, and it would be a monumental upset if the Shockers don’t enter the NCAA Tournament with a 34-0 record. How Shocking Would a Perfect Wichita State Regular Season Be? 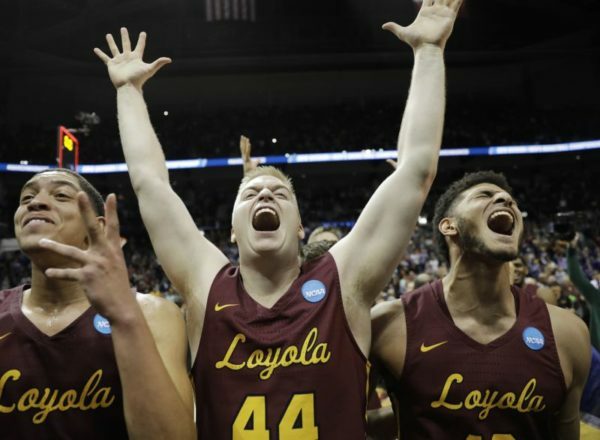 Last March, they were college basketball’s flavor of the month. This season, the Wichita State Shockers may be spending more than just a few weeks as the taste of the town. With Tuesday night’s 72-67 victory over Alabama now in the books, there’s nothing but clear skies and smooth sailing ahead for Gregg Marshall’s team. Old MVC foil Creighton is now competing in the Big East, and with a concluding schedule that features just one current top-100 team, the prospects of a WSU perfect regular season may have just bounded over that line separating dreams from reality. The Shockers should be favorites, and usually heavy ones, in every one of its contests from here on out. But all that isn’t to say that Wichita State is likely to complete this monumental task. 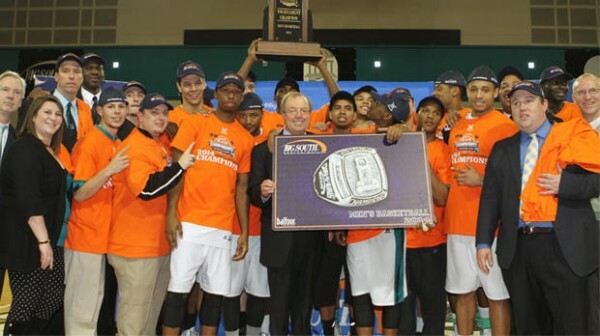 No historian is needed to examine the case of 2012 Murray State; those Racers could tell you how owning a loss-column “0” makes February wins that much more of a chore. Opposing teams play harder, their fans cheer louder, and all the while, the national spotlight grows ever brighter. So, no the job won’t be easy. But pair a tough, talented Shockers team with that manageable remaining schedule, and you at least give the laser-focused Marshall a shot at steering them through unblemished. 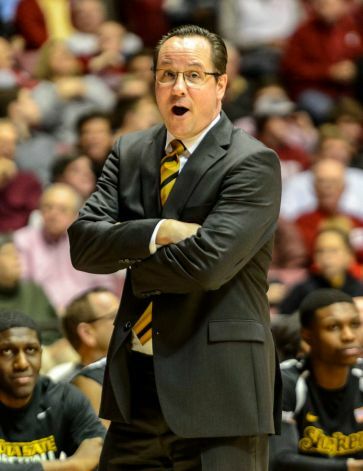 Gregg Marshall’s Team Improved To 11-0 With A Win In Tuscaloosa Tuesday Night. Don’t Hold Your Breath — It Might Be Awhile Before Anyone Messes With The Shockers’ Perfect Start. If Wichita State ends up being the last team chasing perfection, and Jameer Nelson and his 2004 St. Joe’s team also happens to take their cues from the 1972 Miami Dolphins, then here are the three dates that appear most primed for a Hawks’ champagne party. The Bears failed to show off on Tuesday night, losing 90-60 at Louisville, but they won’t be the last team this season to depart the Yum! Center humbled. Paul Lusk’s team is still 8-2 on the year, and with five eminently winnable games of their own before January 11, they could easily enter this Saturday night date with the Shockers laced with momentum. The Bears were picked to finish fourth in the MVC preseason poll and have done little wrong to this point, but this would stand as a significantly bigger upset than the two games listed below. Georgetown lost an excellent player to the NBA Draft in standout forward Otto Porter, but guard Markel Starks thinks that the Hoyas are more than just one player and that his team will look to prove that this season: “We play as a unit… We play as a group. Obviously, we just lost a great player. Even still, with or without him, we play as a unit. … I think we can still be a very dangerous team.” Starks, now a senior, will probably bear much of the weight of Porter’s absence in the scoring column, after averaging 12.8 points per game last season. He will be joined in the backcourt by D’Vauntes Smith-Rivera, who proved capable of exploding for big point totals last season. Smith-Rivera scored at least 14 points in three of his last four regular season games last season, and dropped 33 in 34 minutes against DePaul on February 20. Sports Illustrated‘s [and RTC‘s] Chris Johnson’s “Stock Watch” series sets its gaze on the Big East, and he’s quite bullish on Villanova, while throwing a bit of shade on Butler. Johnson cites Villanova’s surge in the middle of last season, where the Wildcats knocked off top five Louisville and Syracuse outfits in a a five-day stretch, as evidence that Jay Wright’s club is very dangerous. He likes the combination of Ryan Arcidiacono, JayVaughn Pinkston, and Daniel Ochefu, and believes that if the team continues to get to the free throw line and play stingy defense, it can push for the top of the league standings. As for Butler, Johnson believes that the loss of Brad Stevens in conjunction with an increase in the difficulty of conference play will hurt the Bulldogs, as will the departures of Rotnei Clark and Andrew Smith as well as the injury to Roosevelt Jones. I was extremely lucky to be sitting courtside for the first truly great game of this young college basketball season last Tuesday night in Brooklyn where Indiana defeated Georgetown in overtime to win the Legends Classic. IU head coach Tom Crean called it an “epic November battle” and boy, was it ever. The level of play displayed by both teams was incredible for this early in the season, something media row couldn’t stop buzzing about. It was as well-played a game I have seen in quite some time and the atmosphere in the building made it all the more special. Most folks thought we’d be seeing Indiana against UCLA in the championship game but it’s funny how fate works out. The Hoyas proved to be a much better opponent than UCLA and gave IU all it could handle. I’ll give you some of my thoughts on each of the four Legends Classic teams, starting with Indiana: You could call me a skeptic because I didn’t have Indiana pegged as a sure-fire Final Four team but the Hoosiers proved they’ll be in the thick of it come March. Indiana’s offensive attack is second-to-none in college basketball and I love the balance this team has. Jordan Hulls is as pure of a shooter as you’ll find but his leadership and defensive improvement are two things that can take Indiana to the next level. Hulls was all over the floor on both ends and Indiana’s best player in the two games at the Barclays Center. Crean has so many weapons to choose from including Hulls, Cody Zeller, Victor Oladipo, Christian Watford and more. Oladipo’s athleticism is terrific while Zeller is Mr. Steady. Even Will Sheehey adds a spark off the bench with his leadership and intensity. Where does IU have to improve? Two areas stood out to me. One, Zeller needs to get more touches. Part of that comes from him needing to work harder for position and demand the ball but it wouldn’t hurt if Indiana’s guards looked to him some more. Second is tightening up their defense. 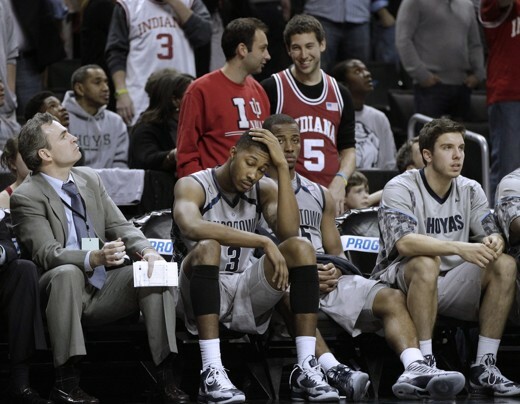 The Hoosiers showed a zone for a large part of the game and Georgetown took advantage with spectacular ball movement. Indiana is a better defensive team this year but it’ll have to tighten that up some more in order to win a national championship. I was overwhelmed by Georgetown’s ability to move the ball and get good shots. This shouldn’t be a surprise given past Hoyas teams but this may be John Thompson III’s best unit not in terms of talent but in terms of basketball IQ. The Hoyas probed Indiana’s defense with precision and overcame a talent disadvantage to the point of almost knocking off the top team in the land. Markel Starks is the most improved Hoya but Otto Porter is their undisputed leader and star player. Porter worked the high post all night against IU’s zone to rave reviews and was a strong presence on defense as well. Even in a loss, Georgetown established itself as a Big East contender. UCLA and Georgia rounded out the Legends Classic. The Bruins are an absolute mess defensively and the lack of hustle and intensity is a major red flag. Shabazz Muhammad made his debut and scored a lot of points but didn’t “wow” anyone. Kyle Anderson seems lost offensively and isn’t having the impact many thought he would. Jordan Adams looks like a future star but this team needs to start defending and playing with a purpose if it has any intention of saving Ben Howland’s job. Things are not pretty in Westwood, especially after Sunday night’s stunning collapse and defeat at the hands of Cal Poly. As for Georgia, it was clearly the worst of the teams in this event. That doesn’t mean the Bulldogs are a terrible team but I would be surprised to see them in NCAA contention. Kentavious Caldwell-Pope is a very good scorer but his shot selection leaves a lot to be desired. I don’t think Georgia is as bad as early losses to Southern Miss and Youngstown State would seem to indicate but I don’t see this team winning more than seven or eight games in the SEC. They do play hard and didn’t back down against two blue-blood opponents.